OK, so the title is a little bit of a misnomer. I have been a part of several backchannel experiences at professional conferences. However, I've never invited my students to backchannel during my class. According to the TodaysMeet website. I've enjoyed contributing to and learning from these audience insights in the past. However, I've never invited my own students to backchannel while we were in the midst of a class activity or discussion. 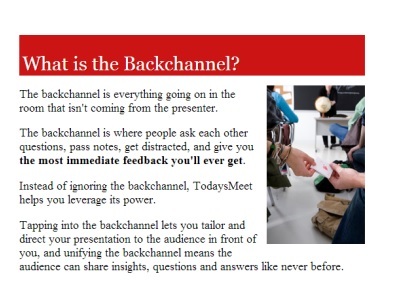 After looking at a few backchannel platforms, I decided on TodaysMeet. I was especially inspired by Richard Byrne's post on his blog Free Tech 4 Teachers. So, here is a reflection on my first forays into backchanneling in my own classroom with my own students. Both attempts involved documentaries. Students at this particular age and level tend to be eager to participate and prove to their teacher that they are working to understand the material. They watched an 18 minute Discovery Streaming documentary on the origins of the Industrial Revolution in Great Britain in the late 18th and early 19th centuries. The most obvious reason for viewing the short film was for them to learn content, but we are also constantly working to teach them to recognize bias in primary and secondary sources. So I asked them to take note of statements or ideas that were presented in a positive and/or negative light in the film. As a result, they learned material while evaluating the utility and limits of the source. After the experience was over about half of the students reported that they enjoyed the extra brain work while half reported that they found it difficult to attend to both the documentary and the backchannel conversation. They were too shy at first. I had to pause the film and remind them that they weren't being graded on the chat, it was tool for me to make sure they were learning what I was hoping they would learn. The shyness faded. They posted repetitive answers. I had to pause the film to coach them in online chat etiquette and avoiding redundancy. They went silent. There were questions I had prepared thinking that the answers were obvious after viewing specific portions of the film. I was wrong. I posted more probing questions. Sometimes that worked and they seemed to kick in with the chat they way I'd hoped. Other times I had to (once again) pause the film and explain the details they'd missed. To double check on their understanding, I asked them to add those details to the chat. In both instances I recognized that there was a need to assess student understanding one more time before moving on. For the sophomores, this translated to a class discussion that we referenced several times over the subsequent classes. We compared other sources with other perspective to the point of view represented in the Industrial Revolution documentary they viewed. For the freshmen, I assigned a short blog post. They used the transcript of our chat (only available online until October 13 before it expires) to write a summary in their own words. They also embedded the video itself into their posts. In some ways, the experience was a success. I was able to pinpoint immediately which ideas my students were able to digest and which ideas they were missing so I could compensate with my teaching. NO ONE had heavy eyelids or was dozing off during the screening of the films. High school students are notorious for this. Students reported that they preferred looking back at the backchannel transcript rather than relying solely on their own notes. In some ways I have some work to do. I need to do a better job establishing backchannel guidelines before chats begin so that I do not have to interrupt the flow of the film/lesson to address etiquette issues. I need to find the right balance between letting students speak freely in the backchannel and providing enough structure so that it is a learning experience. My students need to get used to the idea that it is OK to be chatting with one another on their phones while in class under these circumstances. They seem to be OK with tweeting and texting from their couches while watching TV at home, but they have a totally different set of mores in place when it comes to a film in the academic classroom. Even though the experience included some bumps along the way, I'm looking forward to trying it again in my classes. Backchanneling is already a major part of social media. If we, as teachers, can harness that as a way of assessing student understanding we are doing a better job of meeting our students where they already are. I know some will think that backchanneling in class is a bad idea because students are, by definition, distracted while participating. But when properly utilized I truly believe it can be valuable for both teacher and students. I had the chance to do some professional learning activities with teachers before school started, and for fun, I gave them ALL their first exposure to Today's Meet, and a few of them interacted with it. I had an idea that most of them would be reticent to put their ideas up for everyone to see, but thought it would be a chance for them to experience it. I'm going to share this post with the social studies teachers and see if any of them take a chance with their students. I appreciate in your blog post how you shared the different stages you went through with your students as fellow learners. I've had a lot of chances to be involved in backchanneling myself in webinars, but helping give teachers guidelines for how to use it in the classroom is something I haven't been able to do . Thanks for sharing the learning! Perhaps you might share a follow-up to this blog post.